Koffler's Magnetic Panels let you display important information while maintaining your great interior design. Perfect for any location including the office, kitchen, kid's room, and garage. Select from our attractive metal surfaces for a modern, sleek look or choose one of our great colors to add warmth to your design. I'm looking to build a magnetic wall over my kitchen sink. Are these magnetic panels strong enough that I could place a pot on them and it would hold? Could I affix a magnetic knife rack or shelf to them? Hello I need a black magnetic dry erase board of the dimensions 2 feet wide by 6 feet length to attach to our kitchen cabinets. Can you quote me this and supply? Thank you! How heavy is the 2�x4� steel colored panel? Could it be put on the wall with command Velcro strips? Do the wet markers work on all of the steel colors? i.e. the white magnetic board (versus the dry erase board). thanks! Can I order a smaller size? Would this material still be magnetic if it was installed behind a plastic laminate? 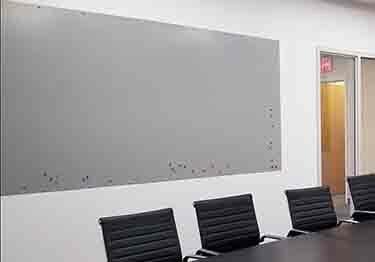 can the brushed stainless steel magnetic board be used also as a dry erase (with the liquid chalks?) is the brushed stainless steel the natural color hence, no chance of scratching paint off? Do your panels work with all magnets, or do they require a certain strength? I have 50-60+ magnets on my refrigerator that I have collected for souvenirs. I wish to remove them and place them on your magnetic wall. Do you think this will work? I would appreciate your opinion before I place an order. Thank you. How thick are the boards? Does the steel wrap around the edges? Do you recommend any special product to use on the joints? I want to purchase a magnetic panel 2' x 4' for a classroom. It will be installed as a removable panel on an existing magnetic dry-erase board. Do you have a board that would be magnetic metal on the back that would affix to our existing board? I would then use magnetic printer paper items on the front of the board. I do not want to use screws - I would like to find a board that will adhere magnetically to the board we have. Is the image shown above the "medium bronze" colored steel? Do snap covers for screws come with the product? We are looking at the magnetic wall panels to mount in our library's children's area, and I'm wondering about the galvanized steel option in the colored steel panels. That particular color sample is not shown in the steel colors. I'm concerned about wear and scraping on the color finish and wonder if we might be better off with the stainless steel? Curious if you have feedback from other customers who have been using these in similar settings. Thanks! I would like to purchase a 2 x 6 colored board,but was confused if the boards are one or the other or both? Dry erase and/or magnetic? I'd like to install one of your stainless steel boards in my sons' room. Are there any sharp edges or anything else that would make it dangerous for them to touch after it has been installed? If the board is installed outside, in partial sun, will it become hot to the touch? I'm interested in the 2x4 or 2x6 stainless steel magnetic panel. Are those shipped flat or rolled? Also, can you tell me the weight on those two sizes? We will have to cut the Stainless Steel Magnetic board to size are there any special cutting instructions? I love the stainless steel magnetic design in the this picture however I am a future law student and looking for something that not only looks good but is functional. Can I use dry erase markers on this board or only the white ones? hi im considering buying a 2x6 white magnetic panel for the side of my white cabinets but I dont want to drill into my cabinetry as this may be a short time item. can this be mounted somehow to aviod screws? is it framable? Can these or any other magnetic panels be installed outside? I was on your site looking at magnetic dry erase board. I was a little confused when I went to order. I am looking at ordering (2) 4� x 4� panels in steel-galvanized steel and I need them to be magnetic as well as dry erase. What would the price be for that? How does one mount the steel panel. I just ordered a 2X4 panel to use in my classroom. Do I need to buy mounting materials? Do you offer custom sizes for the magnetic panels? If so what would the price be for a 3' x 4' steel panel in white? Finished as shown for the standard sizes? Ordered to display my collection of travel magnets and love it! I am in the process of ordering a second one! Agree with other reviews that the edge has a line of marks/dents which is also why I gave it a score of 4 stars. Thank you for your review. We very much appreciate your feedback and sorry for the marks/dents.Unfortunately on rare occasions the shipper may mishandle the this product. If this ever happens again, please call or e-mail us immediately and we can schedule a FedEx return and re-ship a new one at no charge to you. Good quality product with clean finish in the edges.. I like product.. delivery is a little bit slow but it is ok.. Thank you for your review. We appreciate your feedback on the quality of this product. We're sorry the delivery was a bit slow. This product is made to order and every once in a while it may take a couple more days for production, depending on the size. Got this for my daughter to use in her dorm room. Mounted it to a board so she could lean it against the wall. Thank you! Thank you for your review. We're pleased this board will help your daughter better organize things. Great idea to mount it on a board so it can be leaned up against the wall. Also, it is now portable in case your daughter moves down the road. Product delivered as described. Easy to install, did not require anchors and was up in about 5 minutes (if that). The only reason I docked 1 star is that there is a line going down the length of the sheet that almost looks like it was where the metal was fed through the machine to cut it. Not a big deal really, I put it up anyway, but that might bother some people aesthetically. But other than that, great product for the price! Thank you for your very detailed review. We very much appreciate the kind words about our Magnetic Panels. Sorry about the slight line, we would have had no problem exchanging it for you at our expsense, since we stand behind the quality of our products 100%. I've been searching far and wide for an affordable large magnetic board and this one fit the bill. I easily installed it in my kitchen and the color fits my decor perfectly. Because our appliances are stainless, I was missing having a magnetic surface handy. Not anymore! Came in good shape (though it took a smidge longer to arrive than I expected -- was resolved with a call to customer service). I would have given 5 stars if the 4x4 stainless magnetic panel I received had not come with several scratches and dings. They do an outstanding job of packing, and the box of my shipment was perfectly intact, so clearly the lack of quality control is on handling before shipment. If this had been for an office, I would have returned it. But it is for the kids room, so I can live with the damage, it was just really disappointing to open it and see what looked like clamp marks on one edge and a small dimple near the middle given how much effort they put into protecting the panel in transit. We are so very sorry for the inconvenience and dissappointment the damaged shipment caused. As you may know, we would have no problem shipping a replacement to you. If you change your mind, please give us a call or send heide@kofflersales.com (returns department) an e-mail. This magnet board is everything I wanted. It fits in perfectly with my stainless steel appliances. I would definitely recommend! We ordered 2 different sizes, and couldn't be happier with our purchase. The boards really dressed up our Admin Conference Room, and work well for what we needed. The color is beautiful! I was thrilled to find a way to display all our travel magnets! Great service, friendly folks on the phone. Really think Coffer was a tremendous find. Will use them whenever I can. I print photos using a process called Piezography. I puts a lot of ink on the paper and require the use of a hair drier on the print right after it comes off the printer. The magnetic panel allows me to pin the photo on the wall while drying it. Simple, perfect solution to the problem. Metal Pegboard Strips hang long items easily&comes in 3 attractive finishes. Great for garages, workshops,&retail.